Analogue called for a wipe and told everyone to stack up and get ice blocked together. Kaly follows directions well. Ohai there Analogue! A couple days ago, Slice posted about being a little burned out on healing. It just so happens that I heal on the same two classes/specs. So I’m just going to discuss both of them a little bit. I healed back to back nights of ICC10 this week, one on the pally and one on the disc priest. It’s funny how the groups shake out when you do them by open signups on the calendar. Wednesday night we had something like 3 pallies, 3 druids, 2 shaman, a mage, and a lock … last night we had 2 priests, 2 mages, 2 rogues (until one swapped to his pally), a warrior, a DK, a hunter, and a shaman. Perhaps the fact that I started healing late in the expansion has something to do with it, but I’ve gotten past the whole flailing thing on the pally. True, his throughput is not as powerful as it once was. And I’ve never been great at getting the orbs, so I was pleasantly surprised at the end of Dreamwalker to see that I was neck and neck with the most excellent shaman who went into the portals with me. 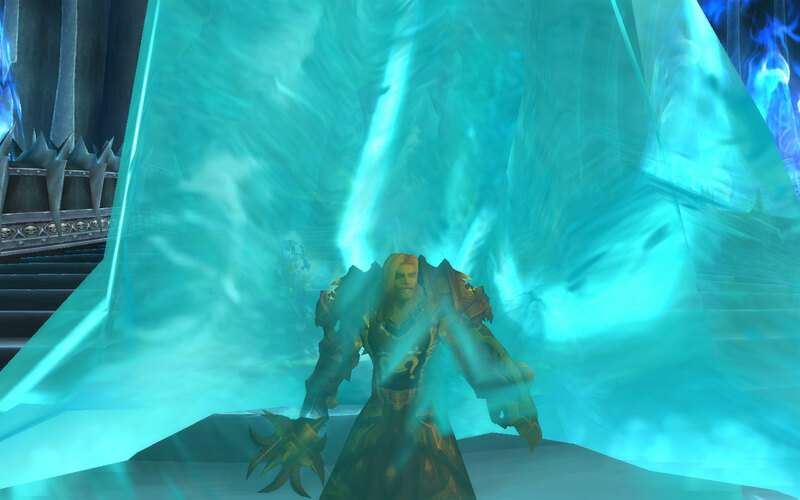 The shaman who was with us last night had not done the fight and wasn’t comfortable with the whole portal thing, so they sent me instead, alongside the holy pally. Now, Greater Heal is awesome and all, but other than Power Infusion, I don’t really have any cooldowns to boost my throughput. The pally, on the other hand, has Divine Favor (further enhanced by the 2pc T10 bonus), Avenging Wrath, and of course, Lay on Hands. Still, I didn’t do too bad, and I got a lot more orbs after having practiced the night before. Is it just me, or did they make those easier to build up? On the paladin, this mostly consisted of Holy Shocks and Word of Glory, with an occasional Light of Dawn when I felt like it, and maybe a Holy Wrath here and there, because AoE dps is teh fun. There was plenty of time for eating chips. The priest though …. I didn’t eat at all. I was too busy yelling ‘squeeeeee’ as I pressed Holy Nova on every GCD and watched my screen fill with both green AND yellow numbers, as well as seeing the entire raid be covered in Divine Aegis bubbles. 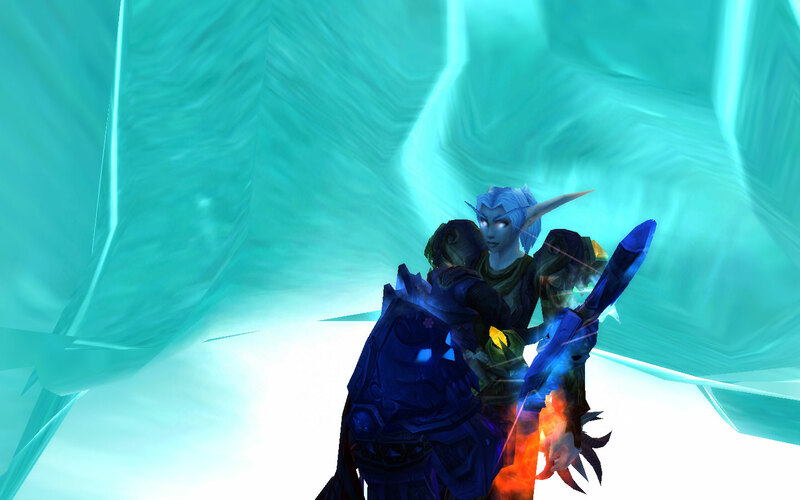 Oh, and as a bonus … autofollowing a charging warrior is more fun than autofollowing a running pally. In all seriousness though, they both do fine and are both fun for different reasons. Disc is never going to be ideal for a fight that requires healing throughput like Dreamwalker, because mitigation is its specialty. But other than the odd and extremely unusual case like that one, they both can handle pretty much any assignment you give them. By the way, anyone else notice that they increased the range on most spells? Rags can smite the axethrowers on lootship, and Kar has a 40 yard range for his arcane spells where he used to have to spend talents just to get 36. Throw in the auto-slow from Nether Vortex, and kiting things as arcane has never been easier. He gets his turn at ICC tonight. I don’t even want to talk about it, but that’s as close as we got. 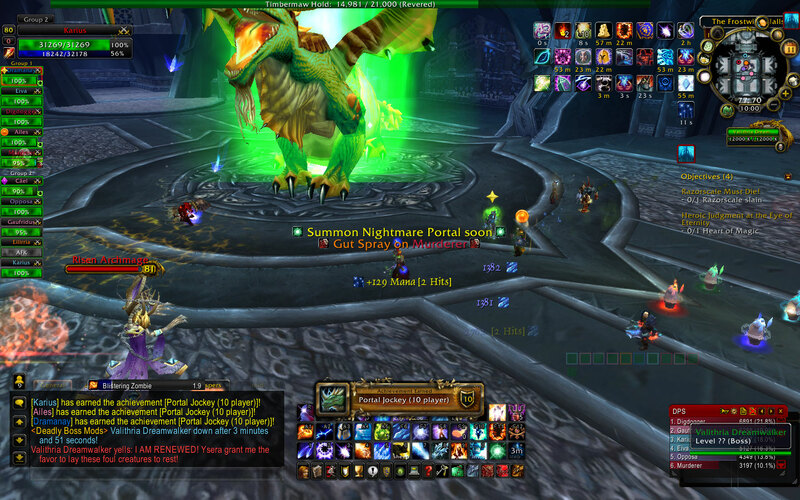 We spent two hours wiping on heroic Sindragosa again, then a little over an hour on the LK himself. Everyone was like ‘oh we killed him in an hour last week, it’ll be fine.’ Yeah, but … they have killed him. They will kill him again. I don’t think any of them knew how much it means to me. I was crushed. I cried myself to sleep. But why do I care so much? I look around the Eventide and it seems like every other person is sporting Kingslayer these days. It certainly isn’t going to mark me as special … not anymore, at least. Ok, so there are only two people in each of my guilds who have the title, so I suppose it would mark me there. But do I really want that? All I’ve wanted since I started raiding was to down everything and get my title with my friends. The mage in the group offered to let me have her spot for the LK fight next week, just for the achievement. I told them I would have to see. Of course I want to go, but … well, Hart will be back sometime over the weekend, so I hold out hopes that our guild group will be back in action. Perhaps I’m a fool and I should just go get my title and be done with it. But then I think of my friends … especially Grom, who has been there with me week in and week out, showing up no matter what else was going on, faithful to the group to the end … the guilt of getting it without him would taint it. Argh! Why did I have to be cursed with a conscience? I swear, raiding has caused me more pain and heartache. My plans for Cata involve letting those friends who are concerned with getting to 85 and jumping into endgame sprint past me while I enjoy everything the new content has to offer. I’ll be ready for the break from it. I probably should just take a break from raiding now but .. I’m stubborn. Ok, enough of this emo crap. I promise next week will return to the regular type of postings you’ve become used to. Apathy took a break from ICC this week. In its place, we ran Naxx 25. They say we need it recorded as a guild for guild progression. Meh, I don’t honestly care *why* we did it … I love Naxx! Imagine I took screenshots of every achievment … ok actually I did, but I was up far too late (reasons for that coming later in the post) so I didn’t send them all over. So just picture a lineup here of those little achievement panels … about 8 of them. One for each wing, one for Fall of Naxxramas, one for the 100 Club, one for Arachnophobia, one for Momma Said Knock You Out, one for … ok maybe it was exactly 8. I got the Heroic Key to the Focusing Iris! squee!! The plan was to go on to OS3D, Ony, and EoE. Well, OS didn’t go so well, mainly because we didn’t have a full raid. This one try though … man, I should have screenshotted myself in the ice block as the only one alive, with the entire island covered in adds and Sarth with 59k health. WTB some spriests or DKs or afflocks … moar dots dammit! We’ll go back and get him later for sure. So the raid ends, it’s midnight or so my time. I’m an hour ahead of server. I go with a guild group to tank a random and Cael whispers me … hey, wanna come to LK? We got Kingslayer last week and we’re going to kill him again this week. Uh …. I hem and haw and look at the clock and think “I’m a responsible adult and I have to work at 9am” … and then Demon Chick on the other shoulder is like “but you could go get carried by Scrubs instead of being a scrub and finally be a KINGSLAYER” … and I cracked under the pressure and said yes. So I hurried us faster than I normally would through PoS and got us wiped on Tyrranus. Oops. But we finished the dungeon, I switched back to Karius, got invited, and zoned into a run that was … 9/12? Damn. I guess I don’t just get a free ride to the King after all. I gotta work for it. Free cheeves! Hey, maybe this isn’t so bad after all. I look around the group, and see all but 3 people are wearing Kingslayer. Well ok, one of those is Cael, and he has it on his lock. He’s tanking tonight though. One of the others … yeah, I look him up on Armory and he’s had the title for a month already. The other one is … me. Pressure? Nah …. well ok, yes. And then they announce “ok, we’re going to be doing Sindragosa on heroic.” !!!!! They did things slightly different than I’ve done it before. See, we had no hunters. So we were free to all stack up in melee, like we do on Marrowgar. Oh, and on heroic … when you have Unchained Magic and blow up? You also blow up anyone within 20 yards of you, so … yeah. That leaves room outside for the two casters who get it to be away from everyone. We had the ‘X’ go to the back left, and the square go to the back right. Easy enough. Oh, and the blasts that you have to LoS during the air phase … those one shot anyone that’s not out of LoS … even tanks. Nasty. Third phase, the first tomb went to the dragon’s head so the tanks could clear their stacks, the second went to the rear. Melee were assigned the to head tomb, ranged to the rear tomb … people with unchained magic could stay outside in the assigned spots and still be able to LoS their stacks of Mystic Buffet. Sounds easy enough. It’s not. Before the fight, the RL passed out Lesser Flasks of Resistance. The other mage and I put up mage armor. A pally put up Frost Resist aura. We had Gift of the Wild. We were required to have 200+ frost resist. Some tries sucked. One try …. we got down to like, I think 3%? It was sooooooooooooo close. I could have cried. We spent two hours on it, and got *that* damn close to downing her. They plan to spend only one hour on it tonight and then just knock her off on regular and move on to the LK. Hmm … maybe tonight I’ll even say something on vent. What? I don’t know any of them and they’re all Kingslayers! Damn straight I hid in my shell and just typed little things like ‘ok’. Can I take a nap now? No?? Dammit.